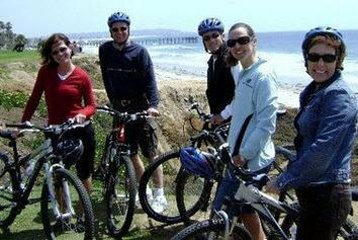 Vá até o escritório de passeio de bicicleta em La Jolla para conhecer seu guia e grupo de turistas. Prepare-se para uma bicicleta híbrida Bianchi e um capacete, depois ouça uma breve orientação e instruções de segurança. Suba a bordo da van de turismo da loja de bicicletas para a curta viagem até o topo do Monte Soledad, o pico mais alto da costa da região. Do topo da montanha, desfrute das vistas panorâmicas da costa e da cidade, depois suba na sua bicicleta e comece a descer a montanha. No seu próprio ritmo, ande cerca de 5,5 km em direção à costa, através da atmosfera charmosa de La Jolla e do cenário fotográfico. Pare na praia de focas para ver as focas residentes da cidade e confira a piscina infantil. Pare nos penhascos com vista para a Enseada de La Jolla e a Reserva Ecológica para algumas operações fotográficas e, em seguida, maravilhe-se com a variedade de vida marinha encontrada nas piscinas de marés. Na costa, siga para Sunny Jim's, a única das famosas grutas marítimas de La Jolla que é acessível por terra. Ouça um guia naturalista falando sobre a geologia e a ecologia das cavernas. De volta à sua bicicleta, pedale até Mission Beach e Pacific Beach, as duas ondas mais populares da região. Depois de ver alguns surfistas trabalhando sua magia nas ondas do Oceano Pacífico, volte ao seu ponto de partida em estradas agradáveis pelas comunidades tranquilas de San Diego. Sua excursão termina na loja de bicicletas após duas horas e meia. On this typical, sunny and gorgeous San Diego day, we started at the top and wound our way down the side of the mountain on the coast. Nothing but pleasure and a good work out. Felt great! Our guide had story after story and comments galore that helped us appreciate this area. I highly recommend! You can admire the sea views of La Jolla while riding the bicycle and enjoying the sunshine and wind. What you can see is the sea shores of La Jolla, the sea seals and sea lions lying near the beaches, and the secret tunnel where the smuggling of alcohol took place in the past. The tour guide is talkative. He was born in San Diego, and he shared to me about his home city. Overall, the tour gave me so much joy. What a nice, leisurely bike ride. Yes, a bit of it was spent in residential neighborhoods, but those are the areas I would never get to see otherwise. The end of the tour is spent near the water, which was fun! It was a beautiful day and an enjoyable bike ride. PS - I only had to walk my bike up a hill once!! This is an awesome tour, and Garrett is a great tour guide! It's the perfect way to see the highlights of La Jolla. Well worth the cost. Really enjoyable trip. Our guide Bree was fantastic. Highly recommended. Very fun ride. Mostly down hill and enjoyed the breeze the whole time. Super great stop half way through to see the lion seals and their pups up close, very close! Not enough coastal scenery the tour is mostly through residential neighborhoods. You're not on a bike path, but amidst traffic, sometimes dangerously so. My girfriend and I went to do this activity last weekend. On top of it, La Jolla was extremely foggy at the time we did the tour, we could not see anything no view, no panoramic landscape, no scenery, nothing but thick white fog. They can't do much about the morning weather, but they could have offered to reschedule to later. Do yourself a favor, just take a bike and cycle around la Jolla, you'll save 40 per person and will have pretty much the same experience.